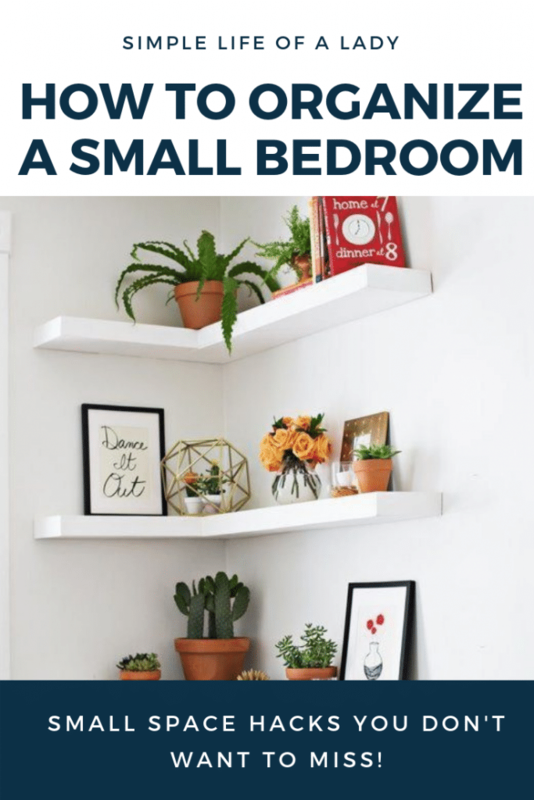 Em Mendoza 2 Comments on 56 SIMPLY AMAZING Small Space HACKS for your TINY BEDROOM! 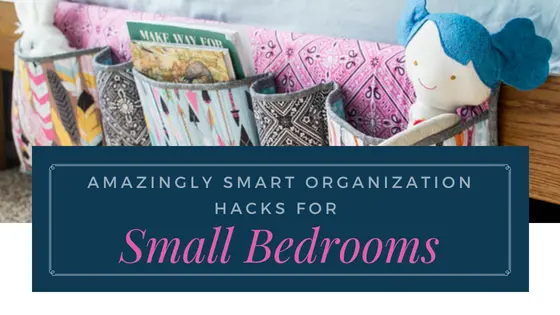 Organizing a small space doesn’t have to be that hard and frustrating. All you need is to find the right combination of tips that will fit your own taste and personality. 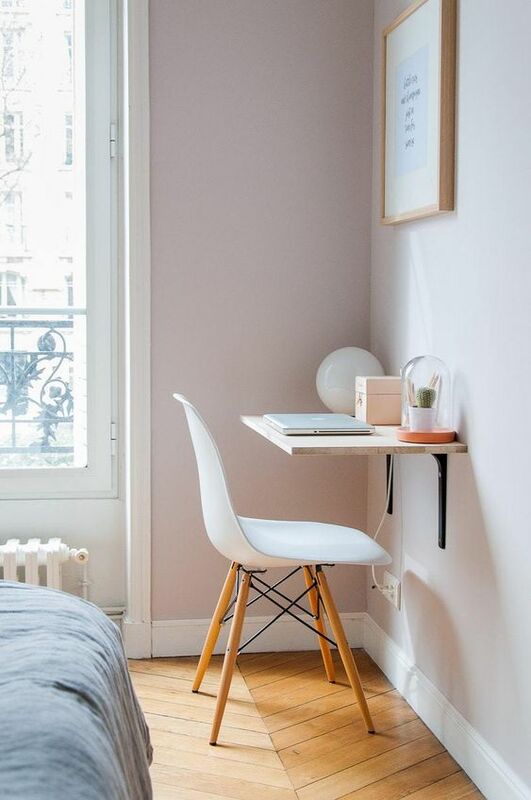 Take a look at these amazing ideas from various sources to maximize your small space. 1. 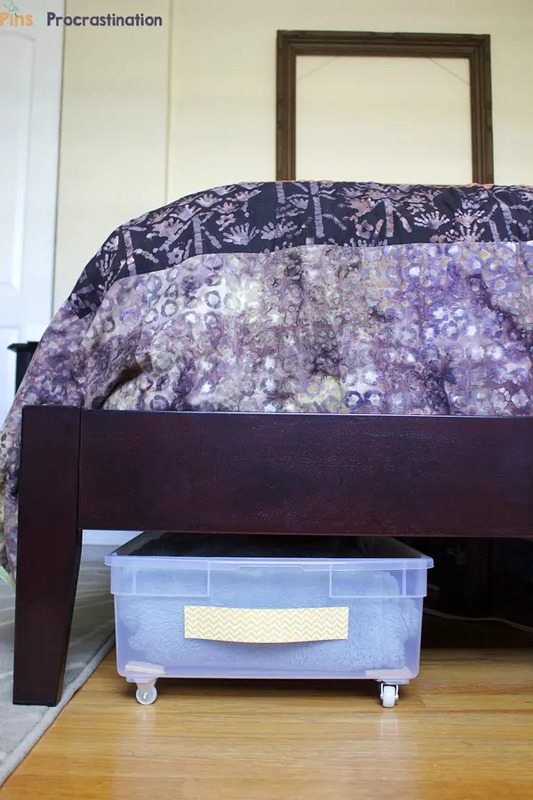 Install built-in drawers under your bed. 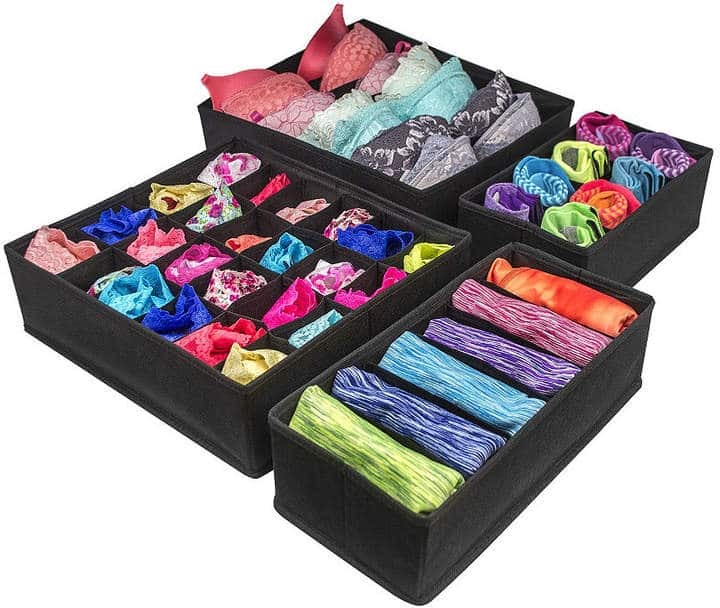 Built-in drawers are a great space for extra blankets, pillows and other things that you don’t often use. These also give your bed a neater look. 2. 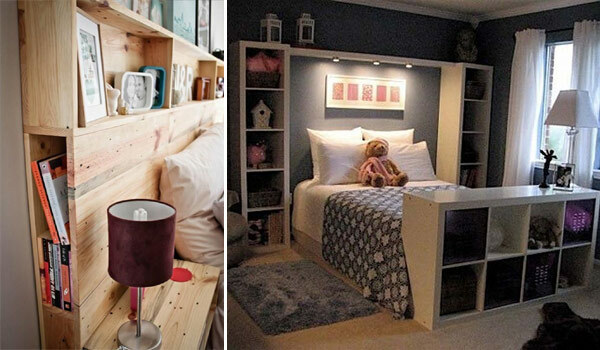 Turn an IKEA shelving unit into an under bed storage. If you don’t have a built-in drawer under the bed, you can customize an IKEA shelf to be your storage area. 3. Use a plastic storage container. I don’t have under-the-bed drawers and I don’t have an IKEA shelf either. So I use this trick to store my extra clothes. Great thing because my small closet doesn’t have to overflow now! This one here comes from Target. It doesn’t have wheels but it has low-friction disks at the bottom so it is easy to slide in and out underneath your bed. There’s also a lid which keeps your items sealed and protected. 4. 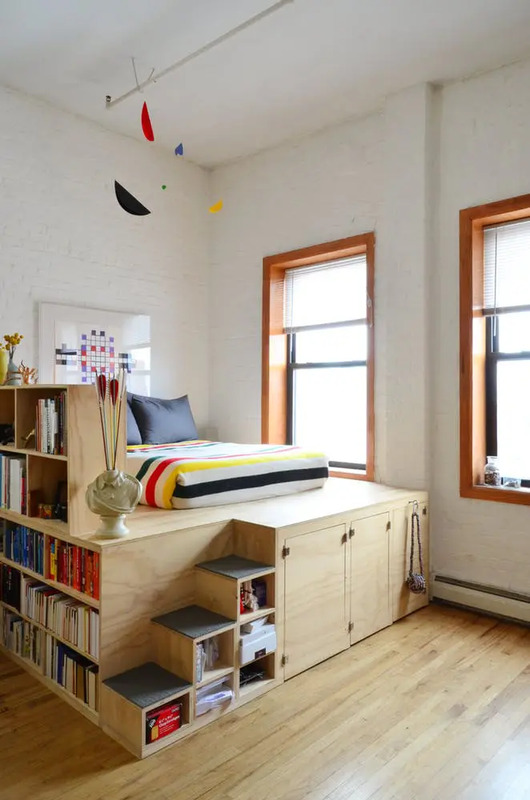 Invest in a flip-up bed with ample storage space underneath. 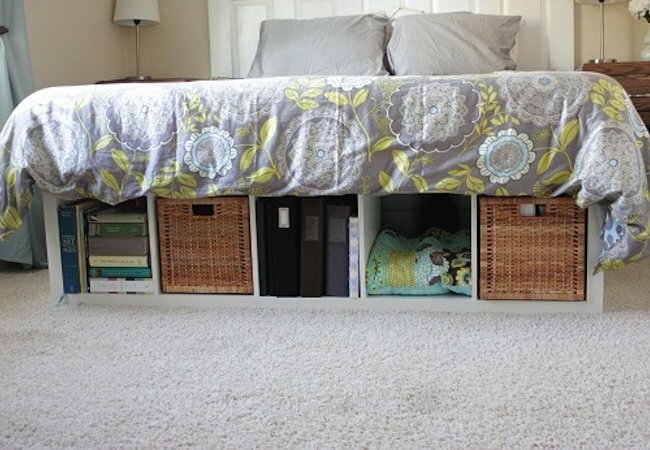 Maximize every space available, plus keep your under the bed storage away from dirt with this clever idea! 5. Invest in a container bed. 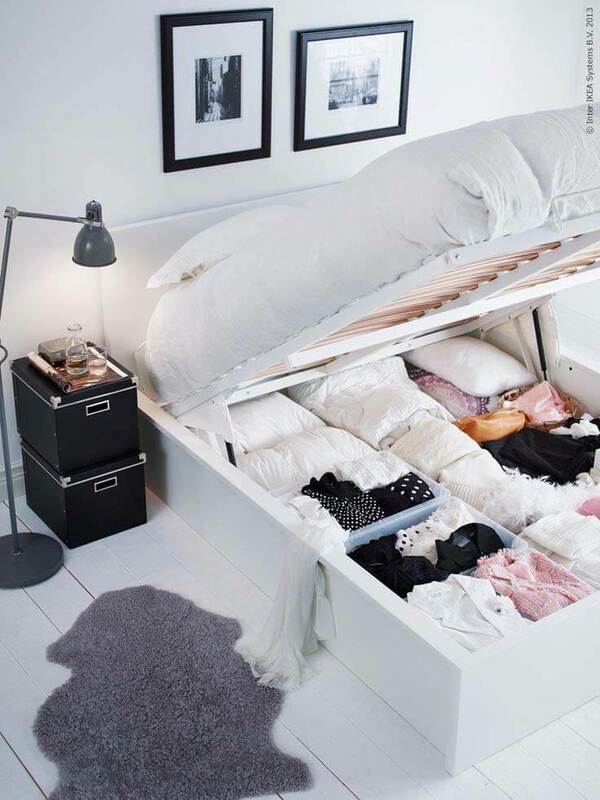 If a really tall bed doesn’t bother you at all, then maybe, you can have your closet just underneath your bed! 6. Build an elevated bed. This is similar to no. 5 in that you’ll need some ladders to get to your bed. The difference is that the bed is not something that you can flip up and down. It’s steady, just like a flooring. Climb up the bed for a peaceful sleep. 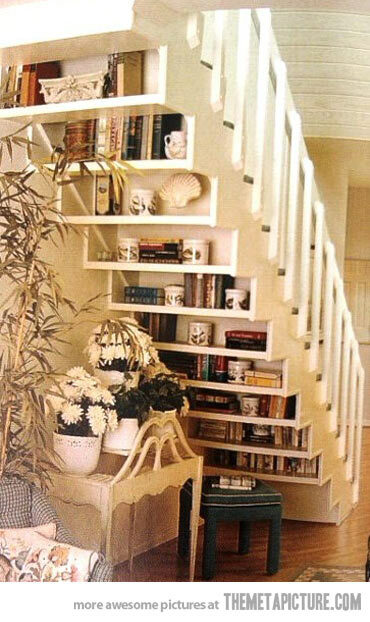 Beside are shelves to store your books. Underneath is another storage area, including the steps. It’s like having a second floor in your bedroom. 7. 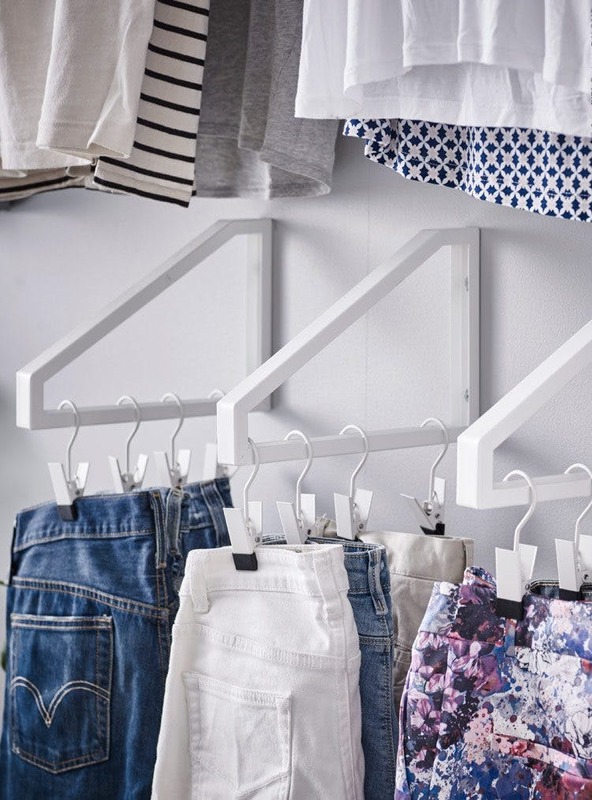 Use a simple dresser organizer to group your clothes. When your clothes are grouped, you know the exact place to locate what you need. Is it a shirt or shorts? You know just where to get it! Also, when there is a designated place for every clothing category, it is easier to see when your clothes are already overflowing. 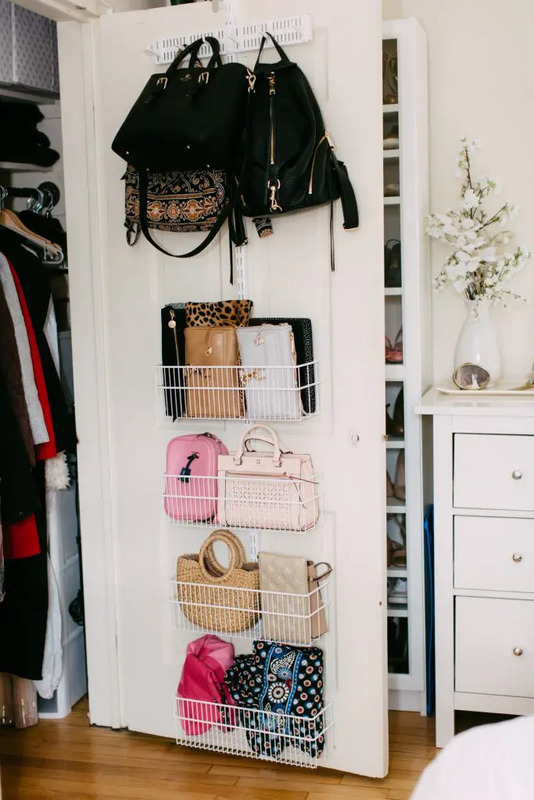 When it does, before you buy another organizer, consider first whether it is space that you need more, or you’re just keeping items that you don’t use anymore. If you do, more organizers won’t help you. You need to declutter your clothes first. 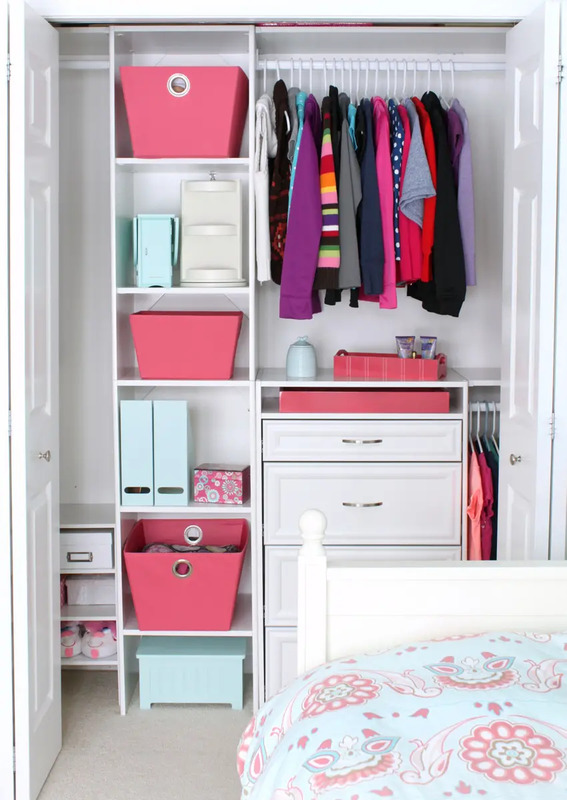 Try these amazing tips from The Spruce to organize your dresser. 8. Buy or make a honeycomb organizer. 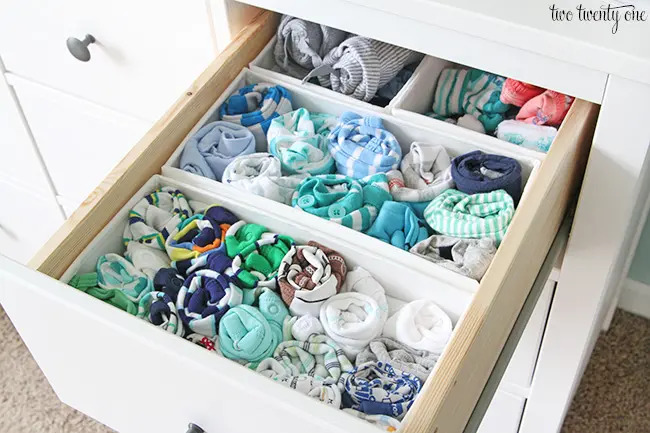 If you don’t want your clothes bumping on each other when you fold them, this one is a practical tip. 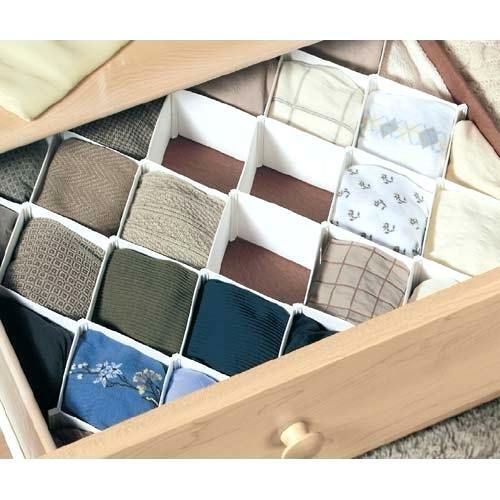 Commonly used to separate undergarments, hankies and socks, you may also use a honeycomb organizer to sort other items. 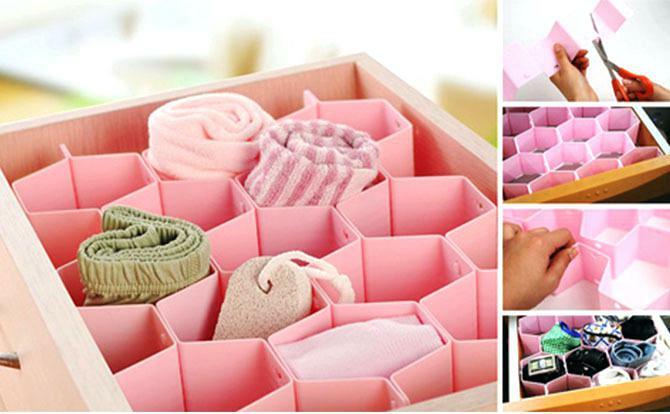 You can also try foldable drawer dividers like this. 9. Use a small pegboard. 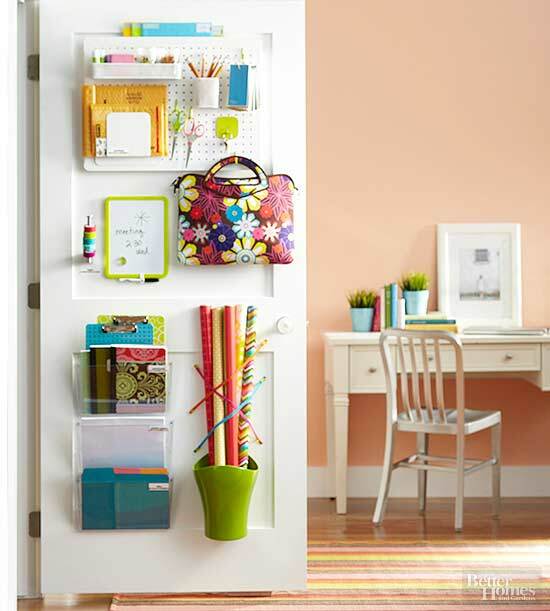 Attach a pegboard at the back of your closet door, together with other storage tools. Utilize that blank space! 10. 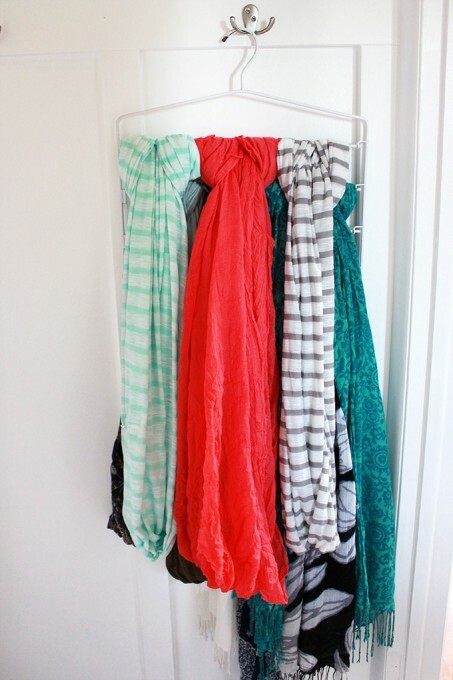 Use pants hanger for scarves. Pants hanger keep the scarves neat and balanced. You can hang it at the back of the door, in the closet, or on the walls. 11. 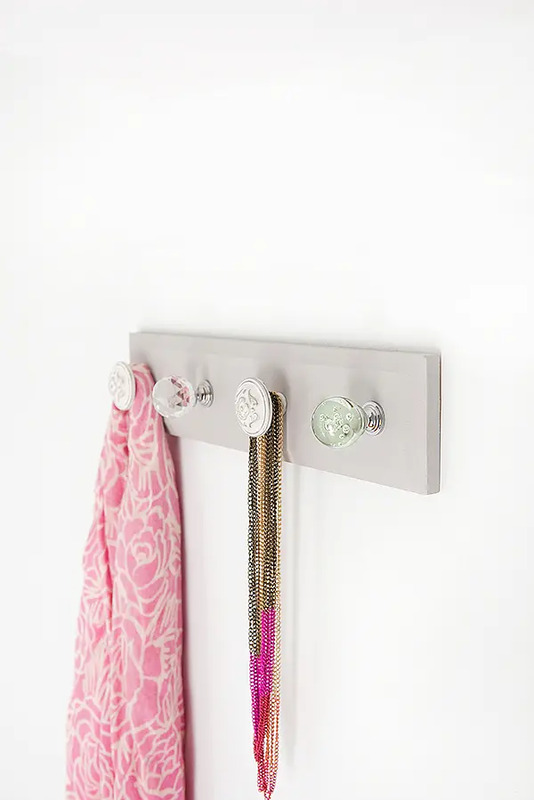 Put hooks behind your closet door to hang your bras. 12. Or use a set of hangers. Just tighten the straps of each bra so they’ll hang really pretty like this. 13. 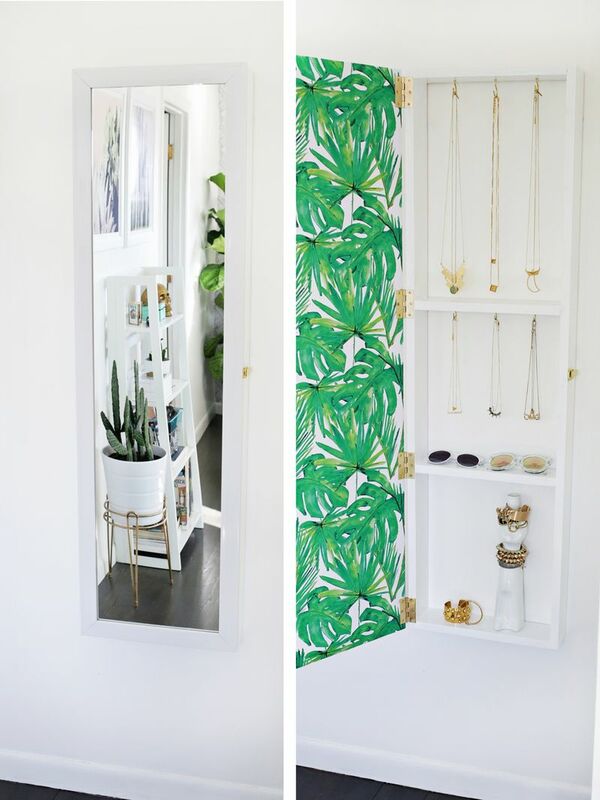 Create a built-in cabinet with a mirror. You can hang your jewelries and accessories inside. Make the space bigger if you want to organize more things in it. 14. Put bins inside the closet. 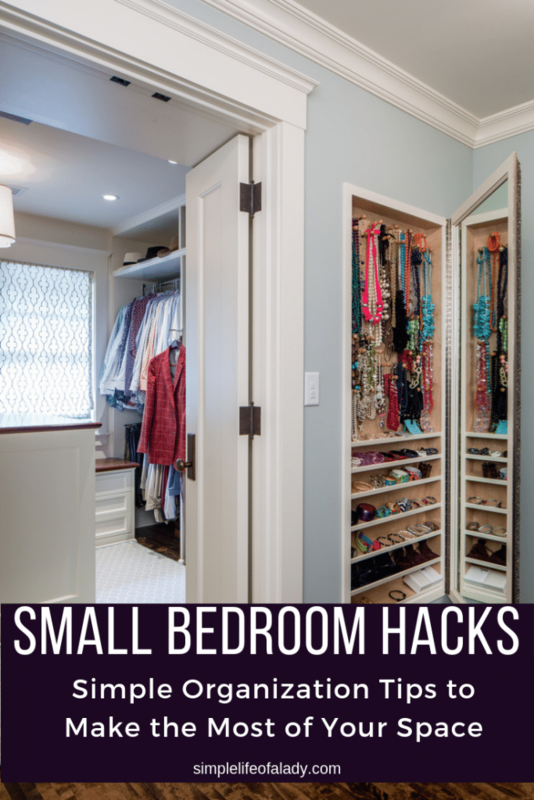 This will help you use up space as much as possible without the closet looking too crowded. 15. 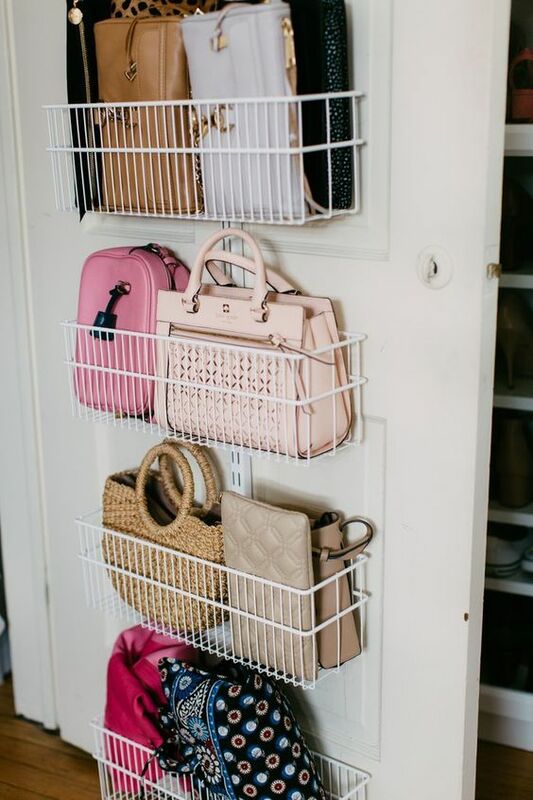 Install wire baskets on your closet door. 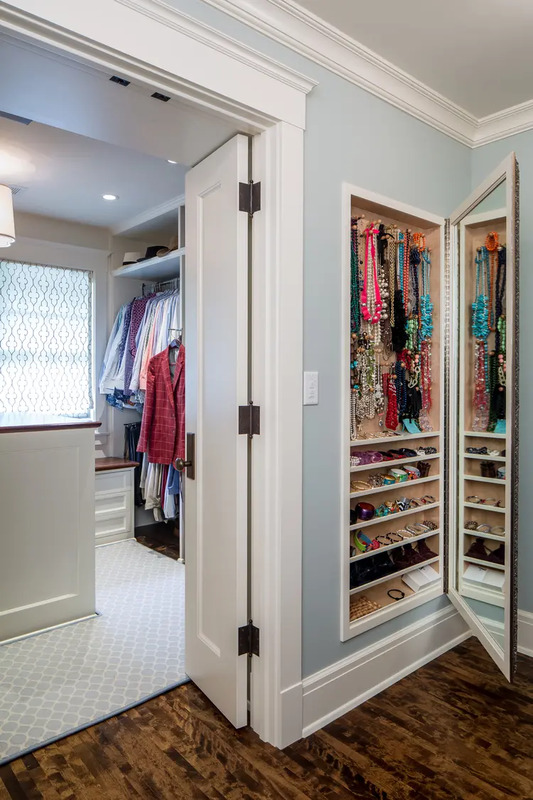 This is another way you can utilize your closet door space. 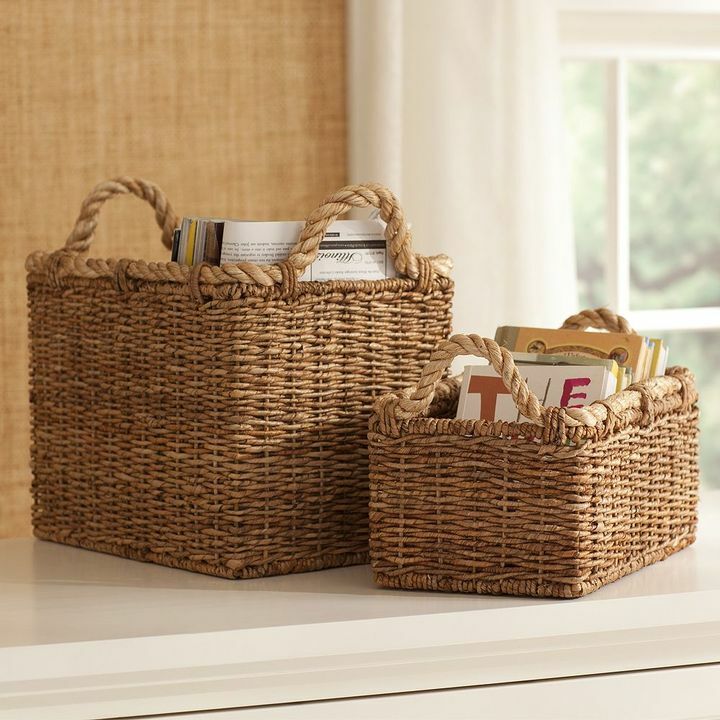 Rather than keep your bags in your closet, with your clothes, place them in wire baskets. 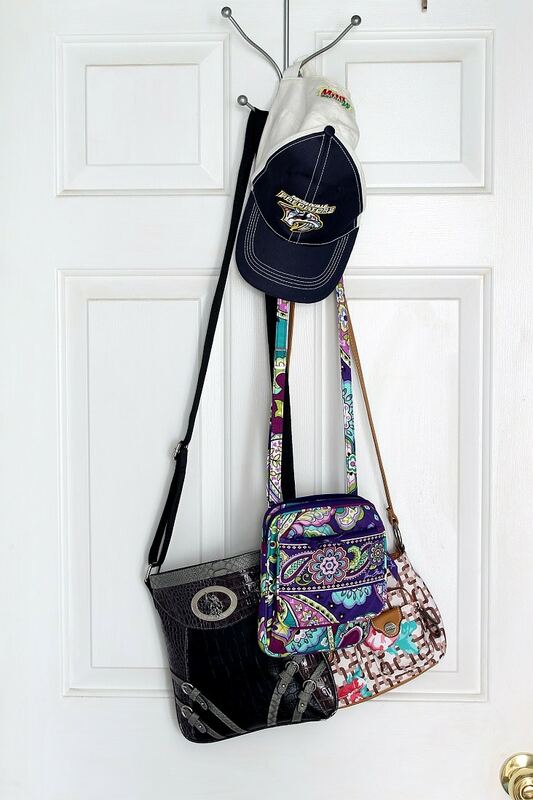 If you have more space on top, place some hooks to hang your other bags. 16. Add a shelf or cubby over the doorway. When I got across this idea, my reaction was immediate – I looked over my door! You wouldn’t normally think of this, but if you have items that you don’t use very often, this is such a perfect place to keep them. 17. 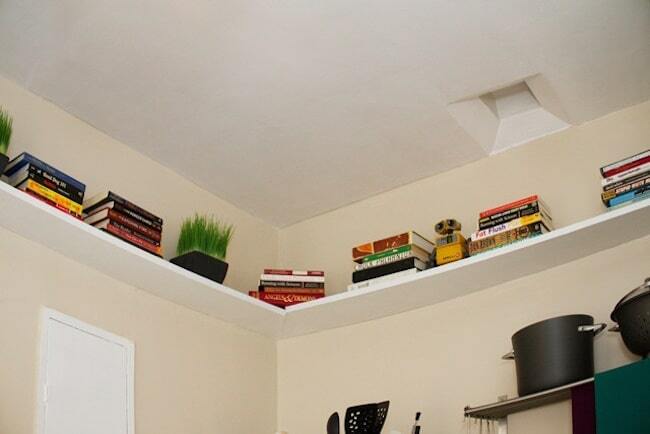 Build floating shelves on the corner. What’s great about floating shelves is that you can maximize the vertical space in your corners. Place here the things that would normally occupy your table, so you can always leave it nice and clean, with only the bare essentials on it. 18. Invest in a Franklin Shelf. This is kinda pricey. But just take a look at what it does. Of course if you can build it, yourself, why not? 19. 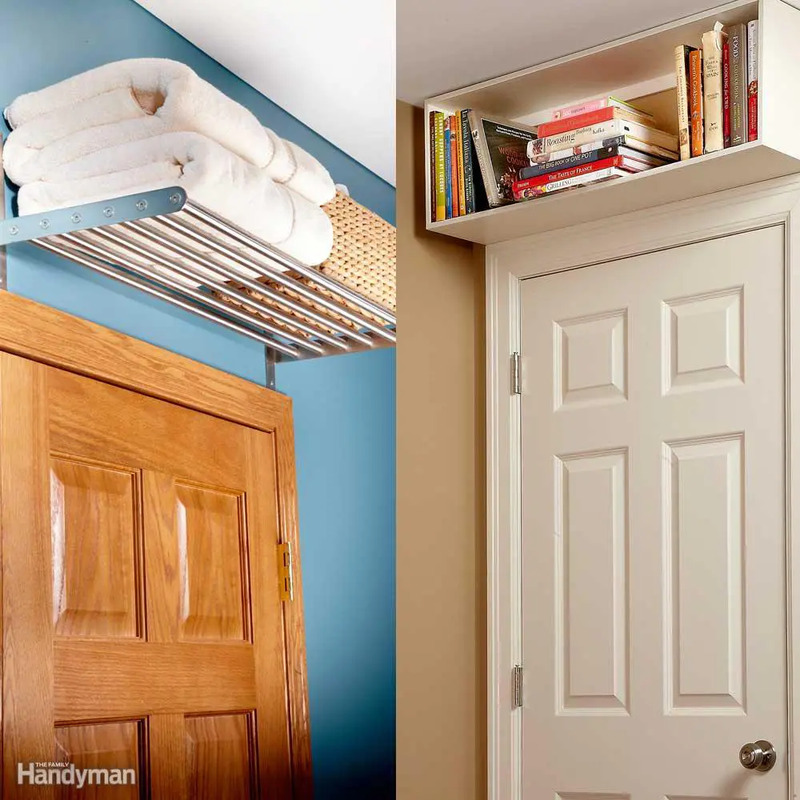 Build a hanging shelf with a secret storage underneath. It looks like it’s just a plain shelf hanging on the wall. Let the Rogue Engineer teach you how to build one like this. 20. Install a hanging table. This is an alternative to the commonly-used bedside tables. 21. Have a bedside ledge. 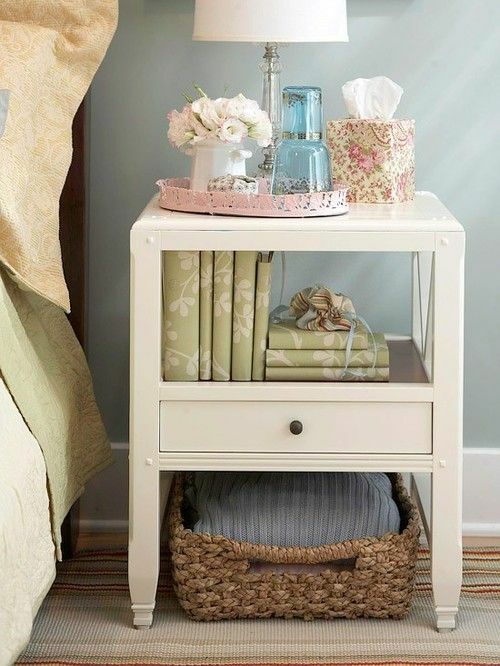 This is perfect if you have no room for a bedside table and you have very little space. 22. Create your own corner shelf. 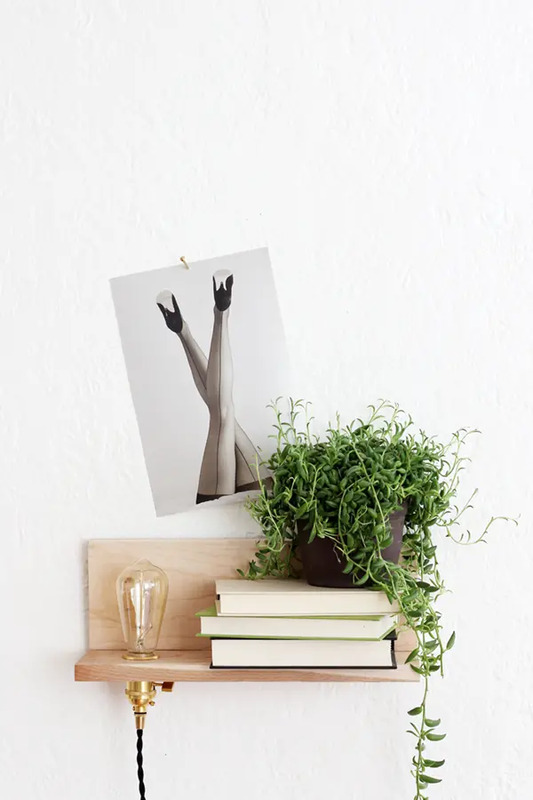 If you can find a simple wooden magazine organizer, you can transform that into a perfect place for your small stuff that you commonly leave all over your room. 24. Turn mason jars into organizers. 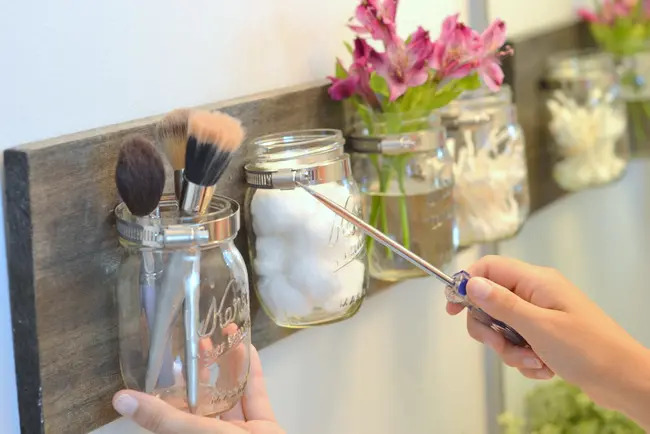 If you are fond of mason jars, build an organizer out of it into the wall. You may not have a hanging shelf, but this too, saves a lot of desk space. 25. Make a personalized hook rack. 26. Make a frame shelf. Do you have old frames? 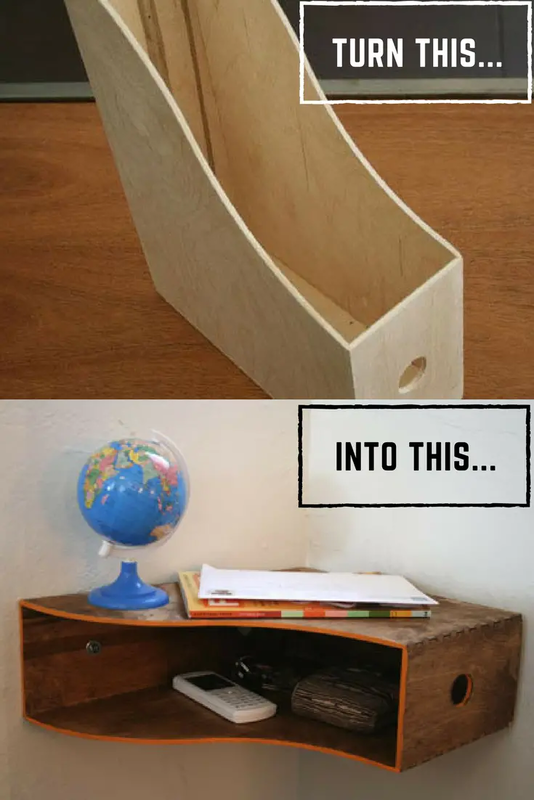 Turn them into storage shelves. Make a box from wooden panels and glue it on the frame. And that’s decor and storage rolled into one! 27. 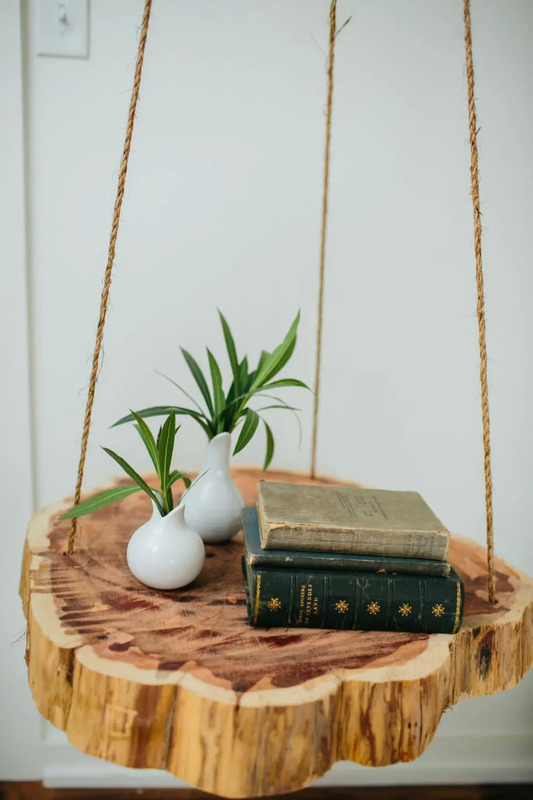 Create a hanging bookshelf with a lamp. 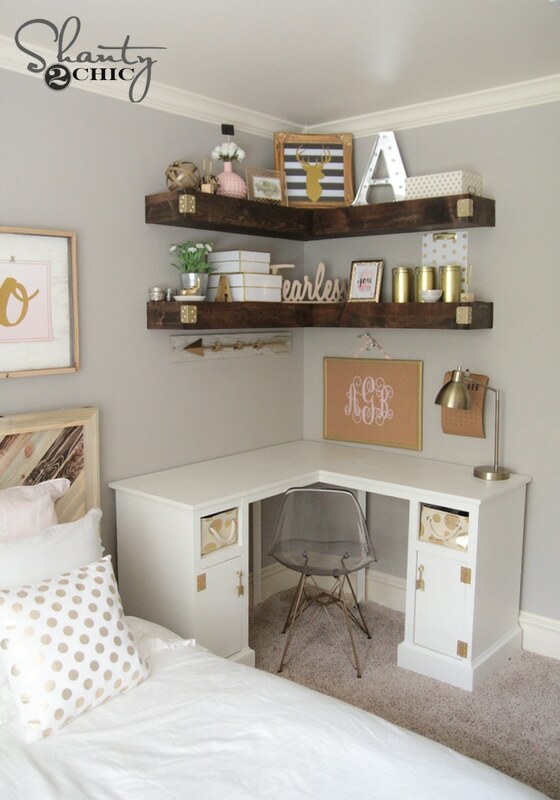 This is lighting and storage combined in a perfect nook! 28. Install brackets into your wall. Your closet doesn’t have to be crammed full. Use these brackets to hang some extra clothing. Or maybe you prefer not to have a closet? 29. Invest in a Murphy desk. Fold it when it’s not in use. Plus you have a storage space on the wall! 30. 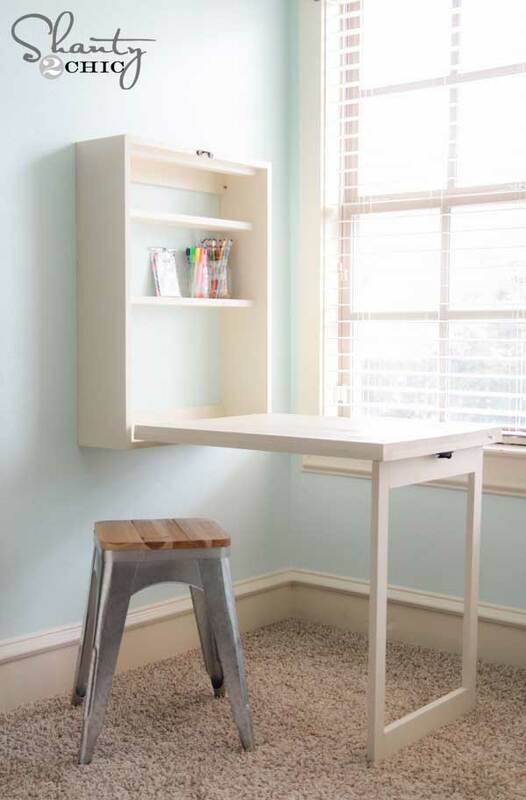 Build a micro desk. 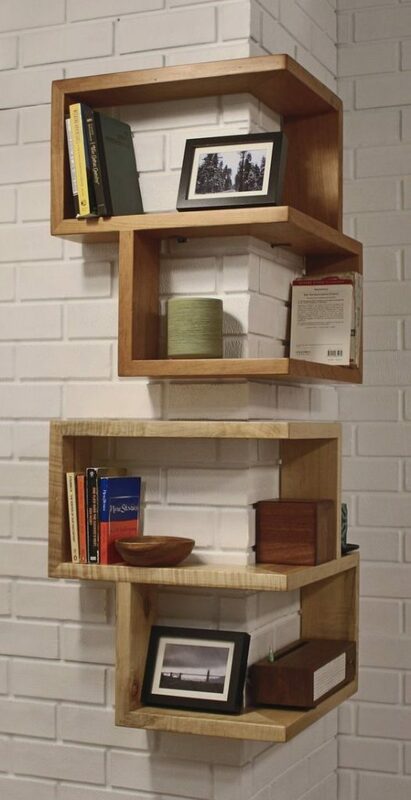 This is a very small shelf that you attach to the wall, which can only hold a few things. It’s a perfect place to do some work, or make a few notes. The advantage of this really small desk is that you are forced to place only a few things here because the space requires it. So you are limited to just what you really need, which is an important step in simplifying your life. 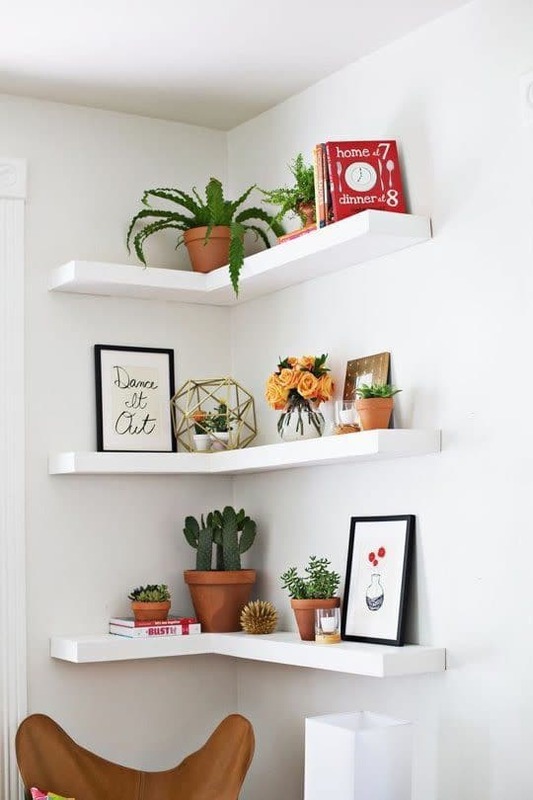 However, if there’s a lot more vertical space above it, you can build floating shelves for extra storage and probably some space for plants and other nice decors. 31. Install a floor-to-ceiling shelving unit. Use it to store and display your items. You can maximize your vertical space and store your items as high as the ceiling. 32. Hang up shelves on the ceiling. If you don’t have much space for furniture, put your shelves on your ceiling. 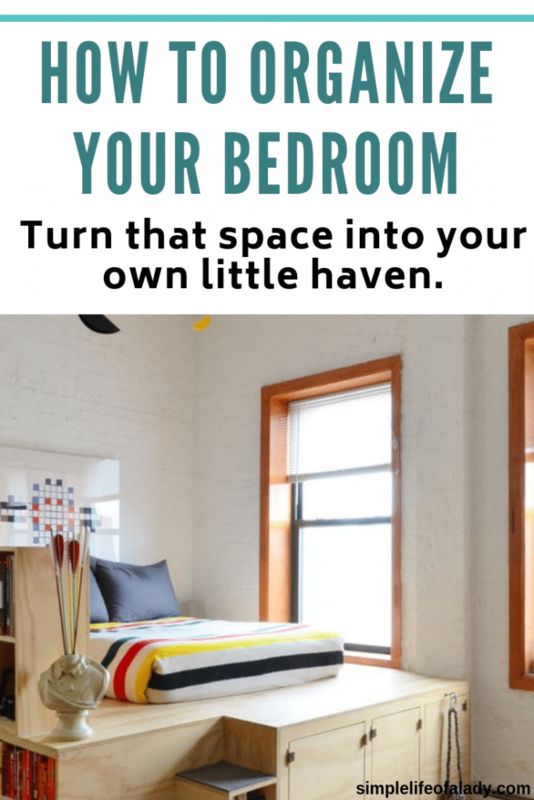 Get rid of clutter and save a lot of floor space! 33. Make a giant peg board. 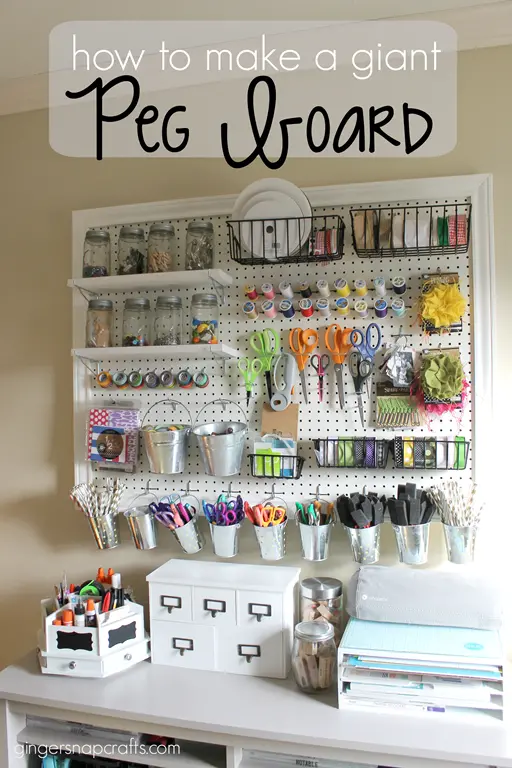 If you have lots of small items that often get scattered, like craft supplies, this is a great way to group them into one area. Then it becomes easier for you to locate them. 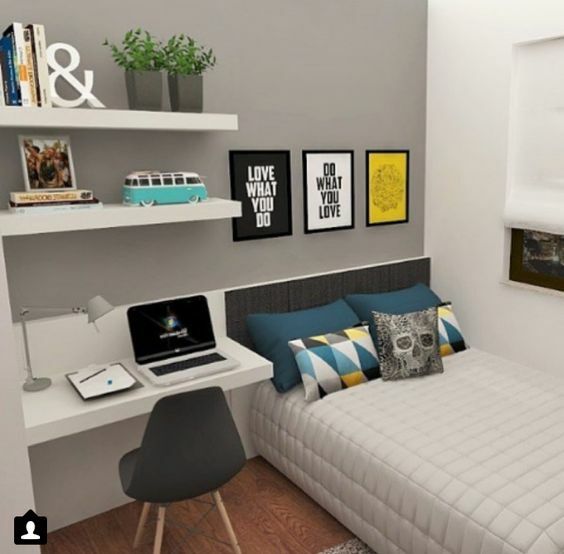 Plus, it looks like a well-crafted decor on your wall! 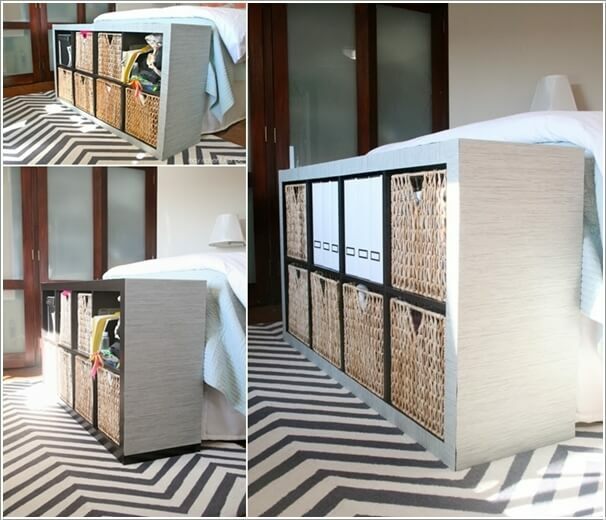 This is a great alternative to cabinets and closets when you want a more personalized bedroom. You can store all kinds of items in this shelves. 35. Invest in a double purpose bench. Be comfortable sitting without worrying about the clutter! 36. Upcycle old tin cans or paint cans to a shoe storage. 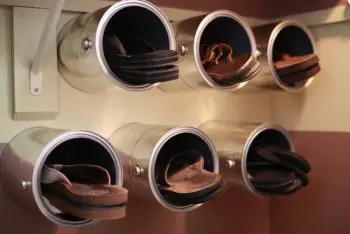 Not the traditional way of keeping shoes but a cool way to turn that junk into a practical storage area. 37. 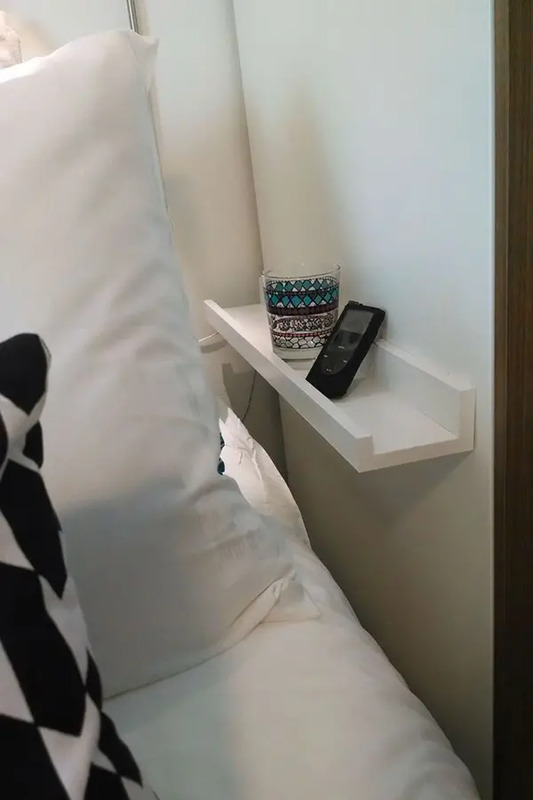 Place a small shelf at the foot of the bed. 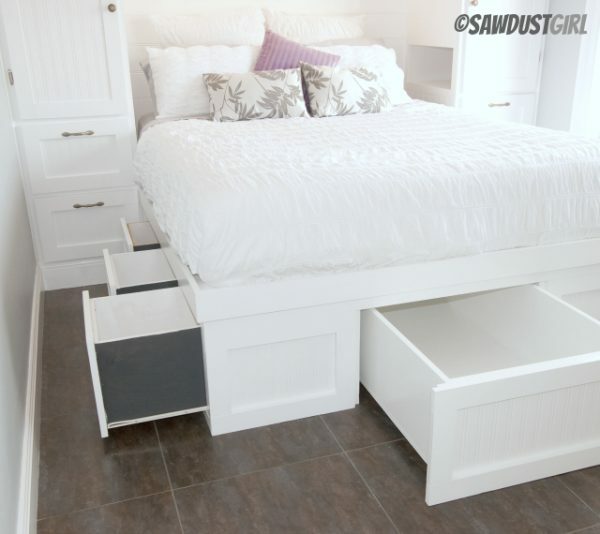 If you do not have a drawer installed at the foot of your bed, this is a perfect storage space to add. 38. 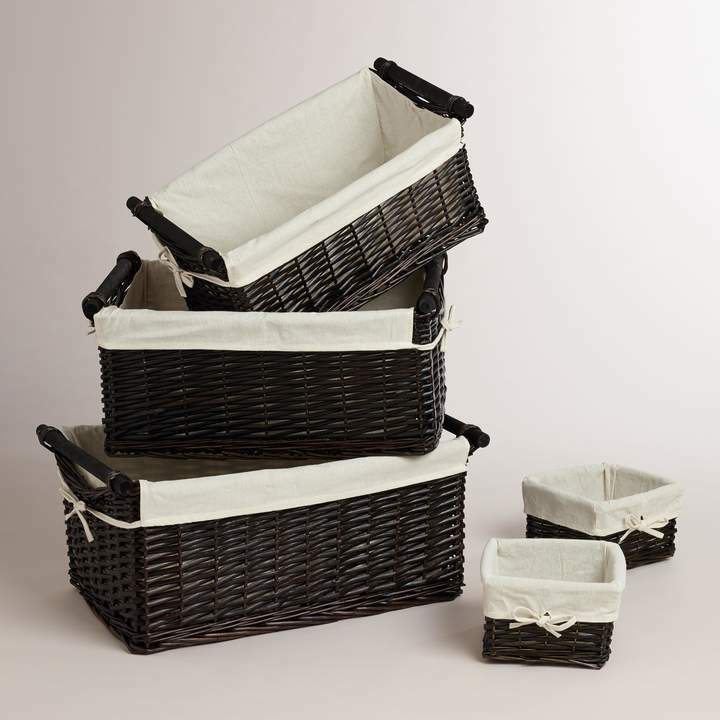 Buy a storage basket. Then you can just put it under your bed or table. Simple yet classy! 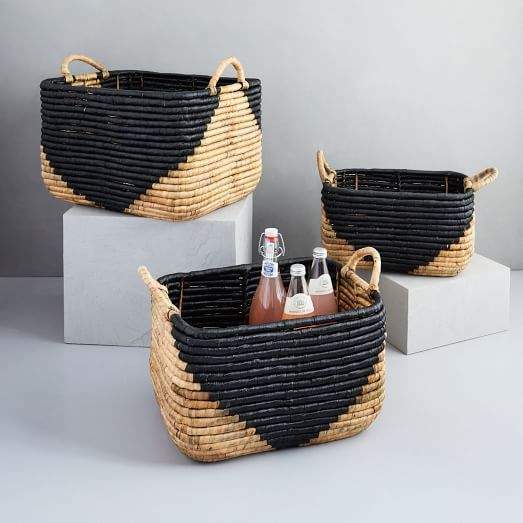 Here are similar baskets you will surely love! 39. Use a bar cart. 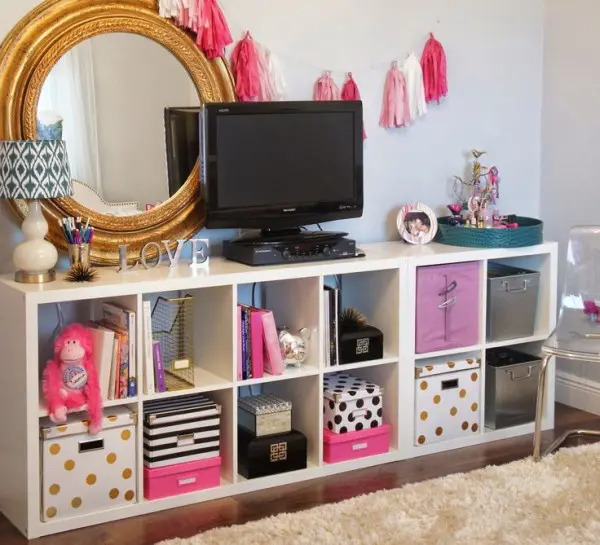 This does not only give you some extra space, but also makes your room look super cute! 40. Invest in a revolving shelf. 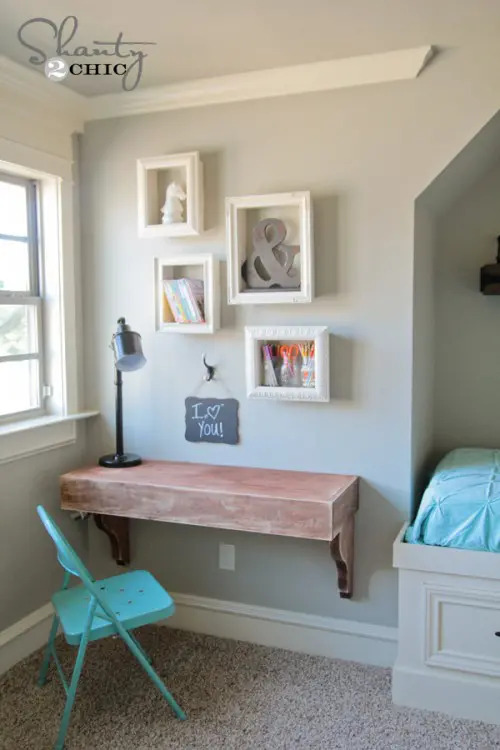 If you don’t want to populate your corners with floating shelves, you can use this one instead. Simply rotate the shelf to locate your things or change the display. 41. 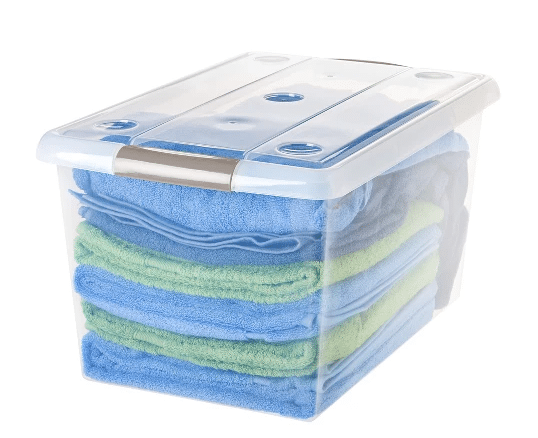 Buy a multi-purpose hamper. I once thought hampers were made for dirty clothes only. Well, this proved me wrong. Looks like it can also be the best fit for an umbrella! 42. Make a multi-purpose headboard to store your items. Headboards provide your back with support when you’re sitting in bed. But who says it can support your back only? Make one designed for another purpose: extra storage space. 43. Make a bedside pocket organizer. Just hang it beside your bed. Store things that you normally reach for when you’re in bed – favorite book, magazine, a notebook and a pen. 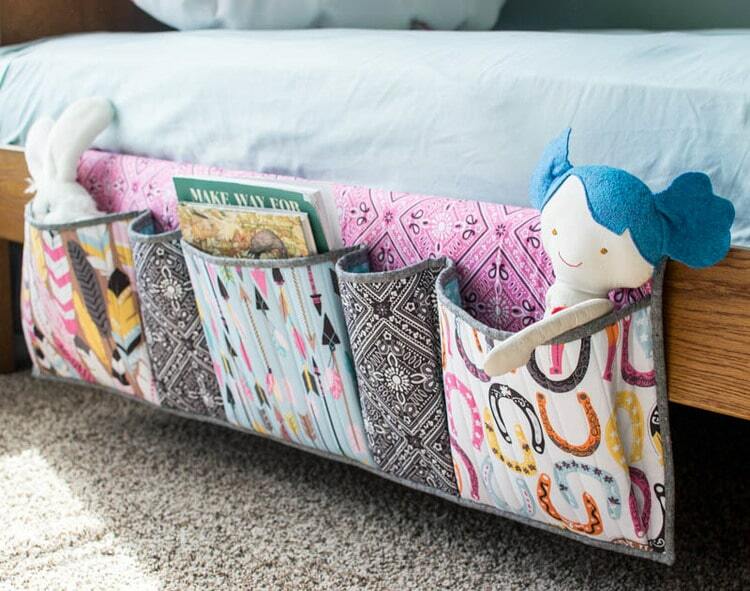 It’s also great for your kid’s bed, to hold the toys when they’re not in use. Then when the kiddo wakes up… oh… you know what happens. 44. 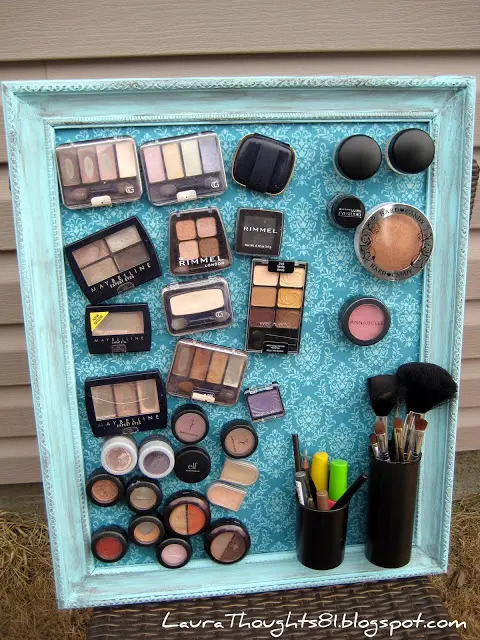 Create a makeup magnet board. Do you usually rummage through your cosmetics every morning? 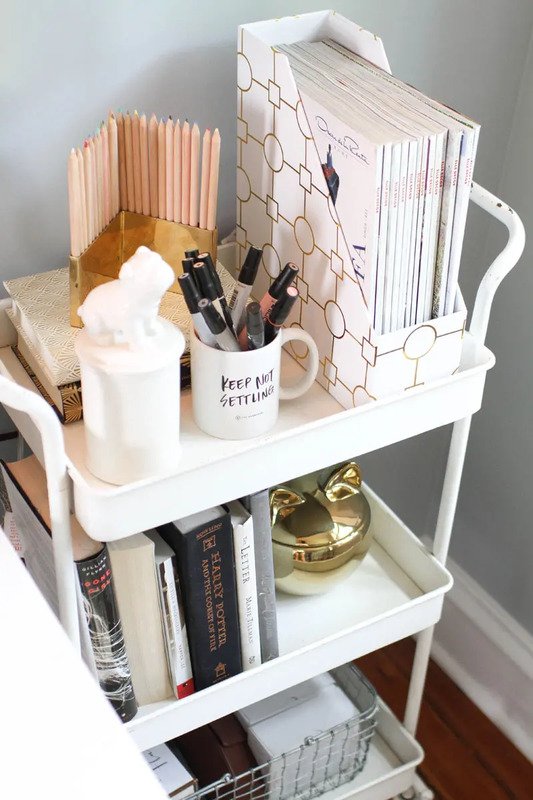 Save your time by this stylish space-saving trick! You’ll be able to see your choices fast without digging through all of your makeup kits. 45. Turn your wooden crate into a storage ottoman. Do you have a wooden crate in your basement? 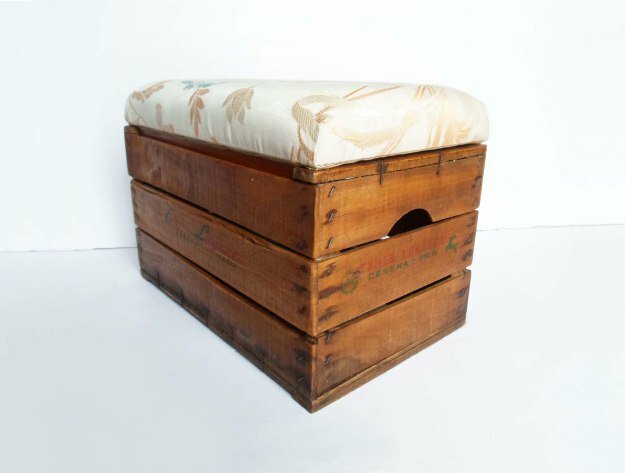 Instead of throwing it away, why not upcycle it into a storage ottoman? 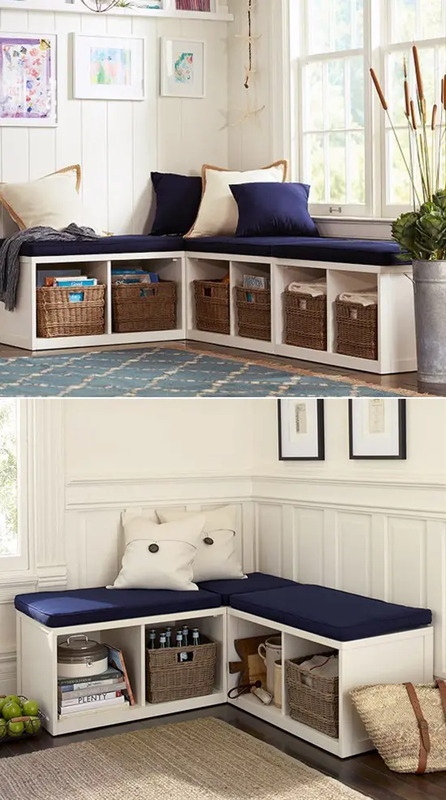 Perfect for sitting and storage! 46. Place a hook at the back of your door. Easy way to hang your bags, hats and umbrellas. 47. 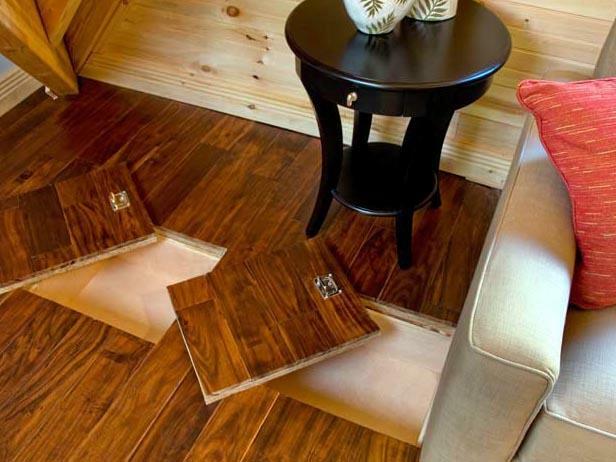 Install storage compartments in the floor. 48. 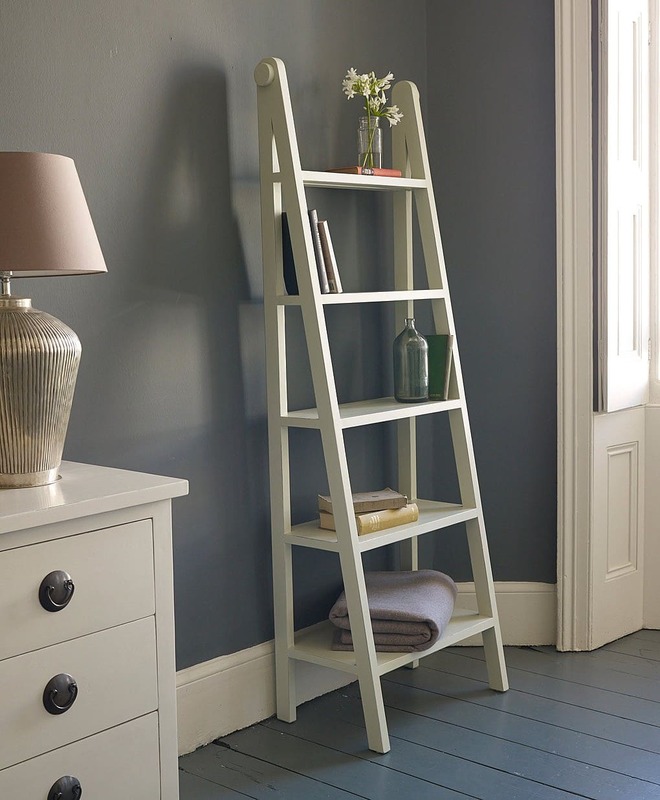 Use a ladder as a shelf. Ladders were made to be stepped on. But you can also use it to display your books. 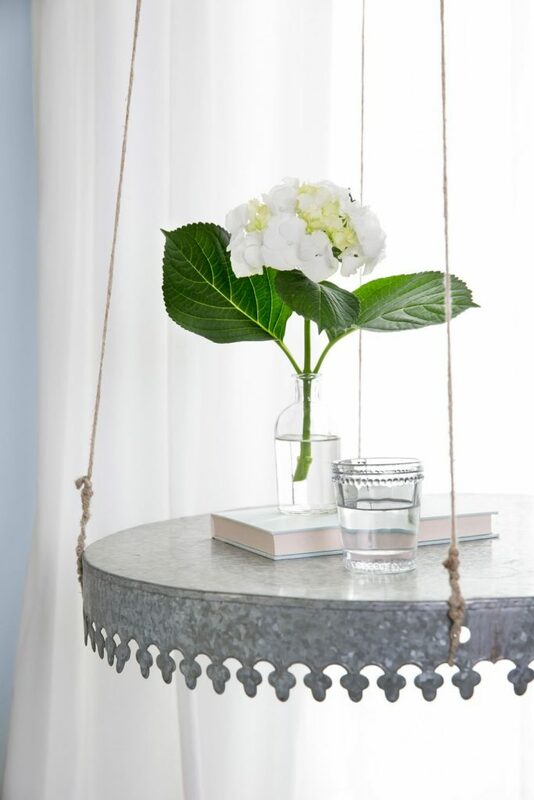 Harness your creative side and it can add to the elegance of your room. 49. 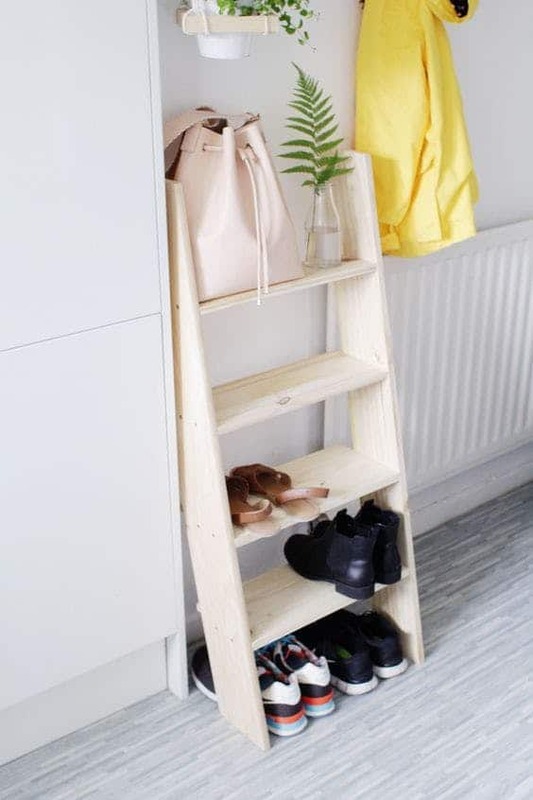 Use ladder as a shoe rack. Yet another practical use for ladder! 50. 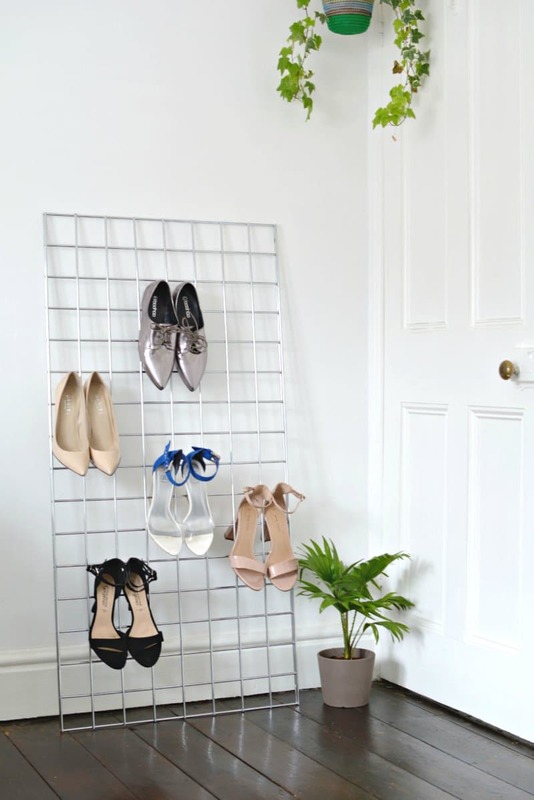 Use a grid to keep your shoes in one place. Another creative way to keep those footwear organized. Doesn’t take up too much space either. 51. 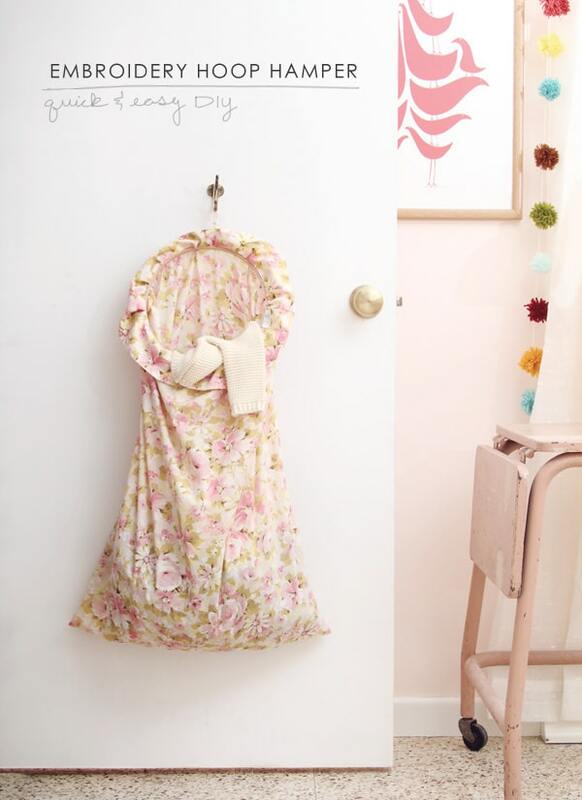 Make a hanging laundry hamper. 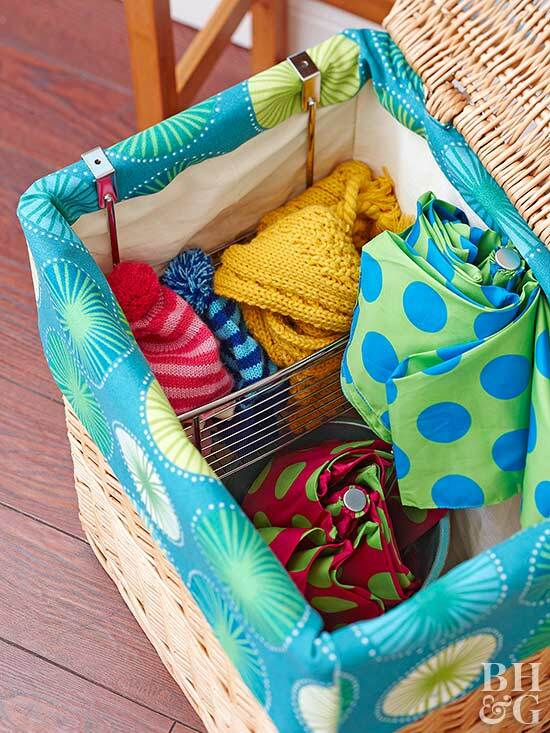 Save floor space by using a hanging hamper rather than the usual standing hamper. Hang it on your closet door or behind your bedroom door. 52. 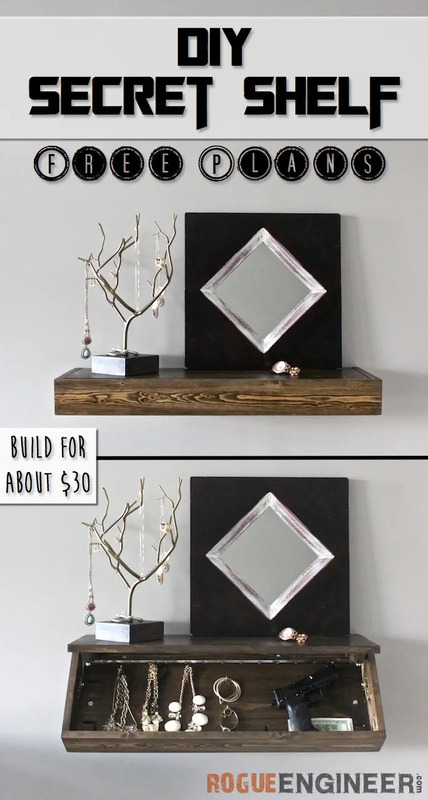 Install a jewelry station behind your mirror. 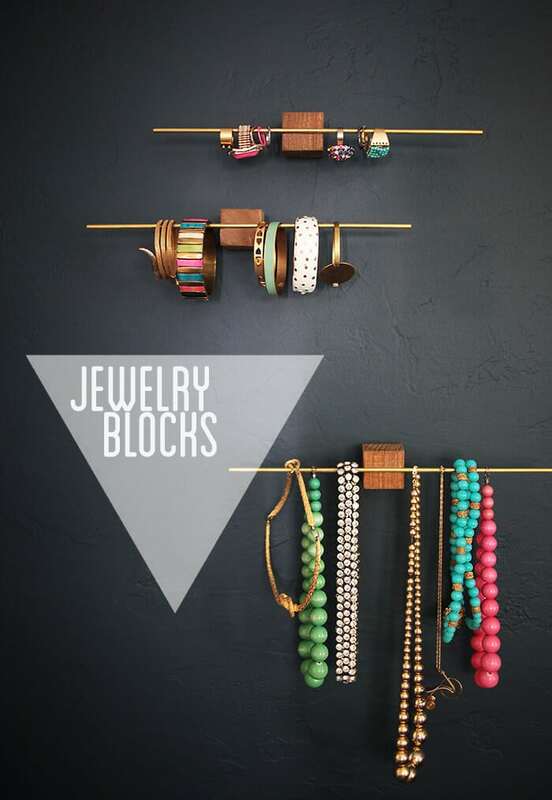 Keep your jewelry organized and well hidden in this clever storage space. Make that small room seem much larger. If you only have a few jewelries, you can say goodbye to organizers. Just let them hang on the wall using these blocks! 54. 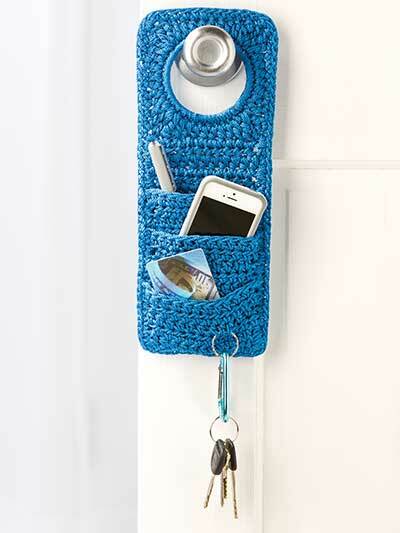 Use a doorknob organizer. This is the last thing you will see before you walk out of your room. You don’t have to forget those important small items again! 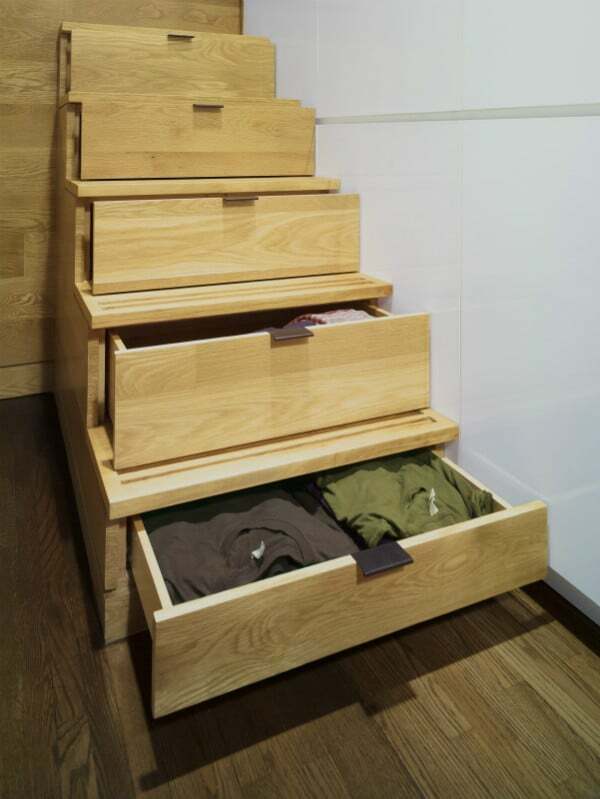 Build pull-out drawers into the stairs. If you prefer to use the back part, here’s one like it. This back part may no longer be a part of your bedroom, but if you’re using the stairs to go to your room anyway, why not utilize the space? Like in this scenario, it’s a bookcase. When you go up to your room, just get one book that you will really read. Leave the rest here. 56. Try the Scandinavian style. Wondering why everybody seems to be in love with the Scandinavian design? Two things… It’s practical, and relaxed. Every furniture is carefully chosen – it must serve its purpose while creating beauty. Few furniture also limits you to take only what you need and love. So there’s just no room for clutter. You know that you will feel a million times better when your room is organized. 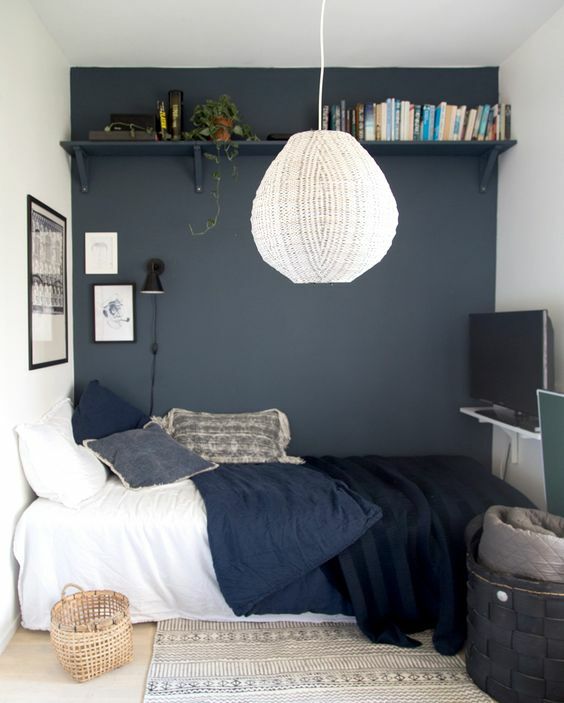 Use these ideas to turn your room into a place of calmness. Do not let that limited space stop you from creating your own haven. Found this article helpful? Take a second to pin it! Sharing is caring! 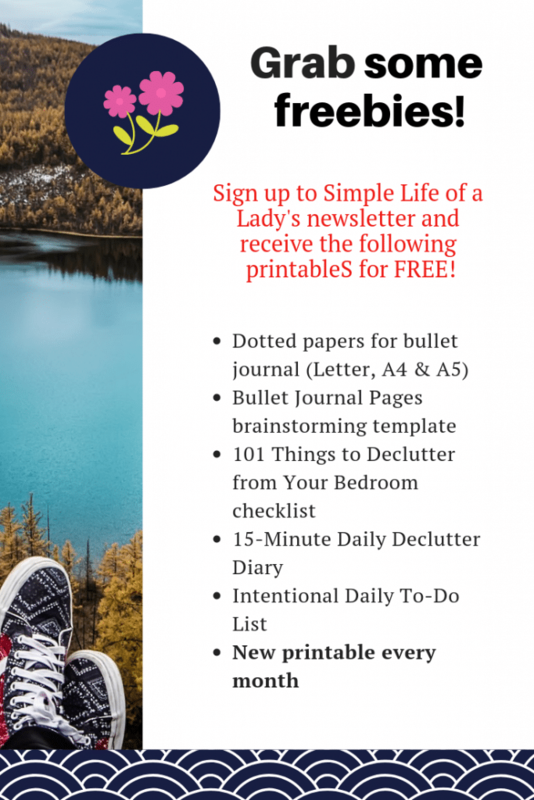 My name is Aly and I would like to know if you would have any interest to have your website here at simplelifeofalady.com promoted as a resource on our blog alychidesign.com ?